What was just an empty filling station is quickly being transformed, with the community and students’ help, into Clay Real Livin’ the Dream Live Animal Lab. Clay Real, a former student at McCool Junction, had an agricultural dream. As a senior, Real was on his way home from an FFA event with the York FFA advisors. That’s where he had the opportunity to see the live animal lab that York had as part of their agricultural education program. From that experience grew a passion and mission for the senior. He called his advisor Dana Hall shortly afterward. He knew they needed something like this. He continued to talk about it, even after starting school at the University of Nebraska–Lincoln. He was going to come back during holiday break to help her figure out how to make it a reality. The Real family donated $15,000 to the McCool Junction FFA Chapter through the I Believe in the Future of Ag campaign. Because of support of Nebraska FFA Foundation corporate sponsors, the chapter received over $1,500 in matching funds and also received an additional $1,000 for winning a video contest hosted by the Foundation. This gave the chapter a great starting point for what seemed like an unreachable goal. They’ve seen great community support since the Reals’ generous gift last February. They’ve received several monetary donations, material donations for the building, volunteer hours and animals, including a hedgehog, turtles, lionhead rabbits, chinchillas, chicks, rabbits and fish. But the work has just begun. 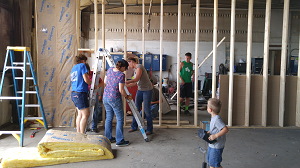 This September, a year after Real’s passing, the community gathered together to begin work on the facility. Over the next several months Ag Ed students, FFA members and community members will work to turn part of an old filling station, donated by Farmers Cooperative, into their own live animal lab. The lab will house their current animals and with room for larger animals, such as pigs, lambs, cattle and horses, to be brought in for a few days for educational purposes. Alex Shockey, a senior and McCool Junction FFA Chapter President says, “I was a close friend with Clay and it means a lot to me to help build his legacy. We knew it was going to be a lot of work, but it will be worth it.” Shockey lives in town and helps out on his friends’ and neighbors’ farms occasionally. He says he’s excited to experience new animals, like experiencing a pig give birth. That’s something he’s never experienced before and he’s most likely not the only one.